The Trust aims to protect and showcase the heritage of the Observatory, and to develop projects connected with public interest in Astronomy. The Royal Observatory Edinburgh, often known as ROE, is the location of two very active major scientific organisations - the UK Astronomy Technology Centre, and the Institute for Astronomy. However, it is also a historic site of considerable importance. 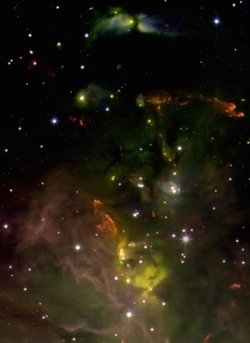 The Trust is a registered charity whose purposes are to protect, preserve and showcase the historical heritage connected with the ROE, and to promote and encourage public interest in Astronomy. 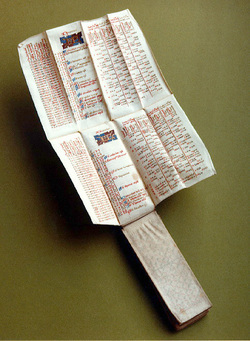 The ROE heritage consists of the historic buildings, the unique Crawford collection of rare astronomical books, and the archives of the ROE itself, accumulated over more than two hundred years. The owners of the ROE site, the Science and Technologies Facilities Council, are good custodians of this heritage, but the Trust aims to build funds to help to develop and protect the heritage, and to make it accessible to a wide public, as well as to historical scholars. To the left you can see a fourteenth century Monk's "girdle almanac", one of the thousands of beautiful volumes in the Crawford collection. You can read more about our heritage in this section, and about the projects we are targeting in this section. The ROE has an active and vibrant outreach programme, organised by the ROE Visitor Centre. Historically, the Visitor Centre was run directly by the Trust, but it is now formally part of the Astronomy Technology Centre. This outreach programme has a handful of dedicated staff, but mostly it relies on the volunteer effort of large numbers of staff and students from the Astronomy Technology Centre, the Institute for Astronomy, and elsewhere. 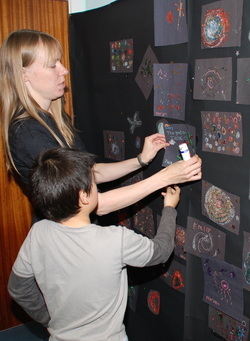 To the left you can see a staff member helping children make a wall of "glitter galaxies" at one of our Open Days. The role of the Trust is now to raise funds for targeted projects to develop and improve the ROE outreach programme - for example, building a planetarium in the West Tower, and developing our exciting new online Virtual Reality planetarium. You can read about these projects here. If you want find out more about the scientific and technical work of the ROE, you should take a look at the ROE webpage. The Institute for Astronomy is part of the University of Edinburgh, and carries out teaching and research, specialising amongst other things, in cosmology, quasars, exoplanets, and carrying major sky surveys. The Astronomy Technology Centre is an establishment of the Science and Technologies Facilities Council. It is the national centre for astronomical technology, designing and building instruments for many of the world's major telescopes and spacecraft. The ROE site also hosts a commercial company called Blackford Analysis, as well as the ROE Visitor Centre. To the left we see an infrared image of the Orion Nebula, an image taken by a camera built at the Astronomy Technology Centre, and processed by staff at the Institute for Astronomy.